I always think those people who are keen to forget the past and only embrace the future are missing out. So I’m going to indulge because Christmas is all about nostalgia (or something like that). 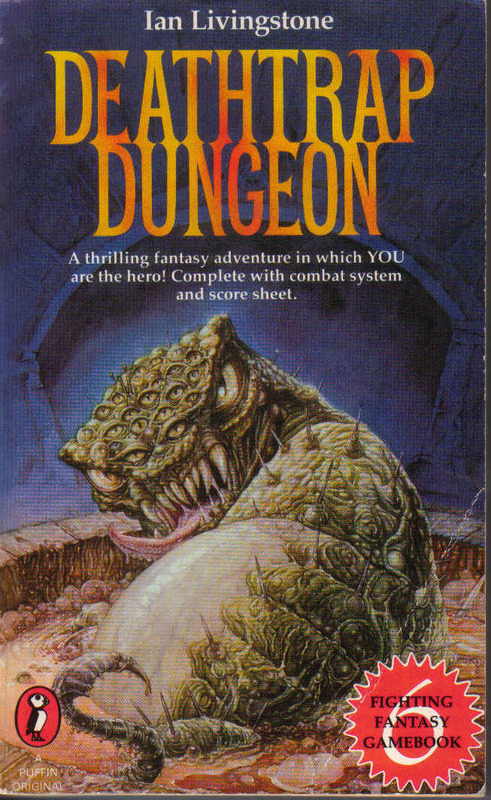 The first adventure gamebook I ever bought was a Fighting Fantasy gamebook called ‘Deathtrap Dungeon’. I remember reading it in a caravan on holiday as a child. I have no idea where we were on holiday because I was mesmerized by the book. 1. Return of the Wanderer from the three book series ‘The Cretan Chronicles’. They were something else – set in a world of greek mythology they were addictively difficult. The downbeat ending of the series has all the elements of tragedy. It was simply brilliant. 2. Lost in Time from the Falcon series. (or was it The Rack of Baal?). Time travelling with a difference – even C.A.I.N the time machine gets anthropomorphic and goes wrong. It includes a sequence straight out of the genre of films such as The Thing. Superb. 3. The Seven Serpents. Part of the four book Sorcery! series. Atmospheric and difficult. Steve Jackson at his best. 4. Overlord. Part of the Way of the Tiger series. In this book you play a leader and have to decide which advisers to listen to. You can decide whether to keep your friends or your enemies close. You are the ruler. 5. House of Hell. Fighting Fantasy gamebook number 10. Atmospheric and at times very spooky. 6. Appointment with F.E.A.R. Fighting Fantasy. You are a superhero. The sheer depth of the storyline in this book is the clever thing. Engrossing and fun to read. 7. Beyond the Nightmare Gate. World of Lone Wolf series. There was just something about the nightmare gate which was so apocalyptic that it stood out from the other titles. You even get to go through the portal. 8. The Grailquest series. Set in King Arthur’s Avalon this series has you playing the hero ‘Pip’ with his talking sword. The genius of this series is that you can take the items from one book to the next. You will need a lot of time to read the whole series, but it is worth it. Good for exploration. 9. Lone Wolf series. Set in the world of Magnamund. Again, in theory you can play these books sequentially and keep many of the objects. 10. Creature of Havoc – Fighting Fantasy. The clever part of this book is that is so infuriatingly difficult to play. What I can’t understand is precisely why there are no mainstream publishers publishing adventure gamebooks anymore. And what more could anyone need for everyday life-skills and the importance of making good choices? Don’t forget my poetry ebook is free if you want it. Happy Christmas.